Early medieval (Viking) lead alloy weight, 21mm in diameter, 8mm thick and weighing 11.39grams. The object is roughly circular in form and rectangular in cross section with rounded sides. It has a slightly concave lower surface with a cresecnt shaped depression, probably accidental. Its upper surface is slightly concvex and has a centrally placed orange stone chip inlaid into it. The only other objects of this nature recorded here are LVPL-AA5D02 and NLM-ACB318, these are more likely to be gaming counters given their form. 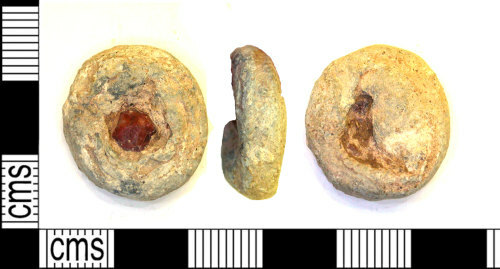 Various weights with the same form as this object have been found at Torksey, Lincs; Woodstown, Eire, and some with depressions suggesting inlay at Kaupang, Norway. Skre, D. Means of exhange, Kaupang excavation volume 2. 2008. p173.